Onaway Senior Gavin Fenstermaker practices the quarterback keeper for his first varsity start at the position. Onaway — The Cardinals kick off the 2018 football season with a new coach, conference and quarterback. 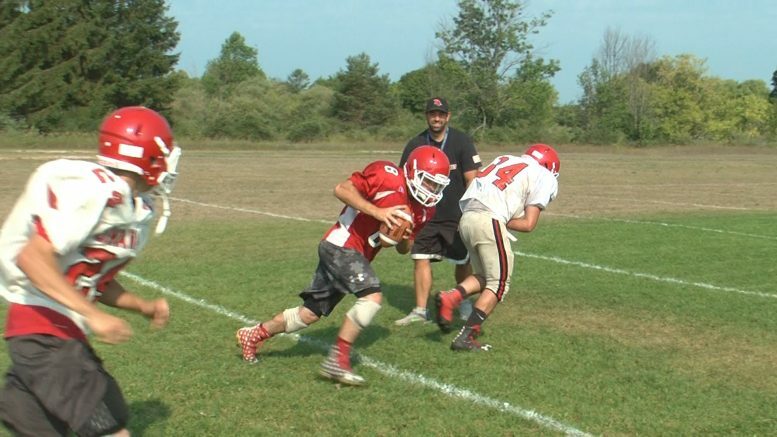 Onaway is led by first time 8-man Head Coach Steve Klinge and the athletes have bought into his new plays and are ready to battle with their 20-man roster. The red and white will face off against teams in the Midwest Central Football Conference including local teams Posen, Hillman, Au Gres-Sims, Hale and Atlanta. Last year in the Bridge Alliance Conference, the Cardinals finished (3-6). Klinge is constantly moving athletes around in the system and he prides himself on placing players in the right position. The first-year Onaway head coach named senior Gavin Fenstermaker as the starting quarterback, a position he hasn’t played since middle school. The senior has competed in the running back position for three years on varsity. Onaway’s first challenge of the season is Thursday, August 23rd at Central Lake. Then the red and white start conference play week two of the season.